Joe Orton’s black comedy “The Ruffian on the Stair” (first broadcast on BBC radio in 1964) has West End transfer written all over it. So catch it at the Hope Theatre on Islington’s Upper street before it goes up West and up in price. The play is a one act gem (at 60 minutes and no interval, it is just perfect). The cast, crew and creatives at The Hope Theatre have put together an absolutely spellbinding interpretation. Orton lived in Noel Road just around the corner from The Hope which gives this production an added frisson. The set alludes to this as the backdrop featuring a row of Georgian terraces much like Noel Road. And the library on Essex Road where Orton and his lover Kenneth Halliwell rewrote the dust jackets of novels which led to Orton’s imprisonment is a short walk away. So for biographical, historical and theatrical reasons, this is very much a recreation of Joe Orton’s world in 1960s Islington. Joyce: Where are you going ? Mike: I’m meeting a man in the toilet at Kings Cross station. Joyce: Oh you go to such interesting places. This opening exchange has all the hallmarks of Orton’s theatrical style. Banality, outrageousness and humour. It’s a combination of Donald McGill’s saucy seaside postcards, the menace of Pinter (“The Dumb Waiter” lies behind Ruffian) and the humour of Oscar Wilde. The “Ruffian” (the very use of that Victorian era word is typical Orton) in the title is the mysterious Wilson (Adam Buchanan), a young lad looking for a room. Joyce: What do you want? Wilson: I’m looking for a room. I’m not coloured. I’m from the home counties. Orton’s genius was his ear for everyday conversation. The word “coloured”, allied to the phrase “the home counties” could only have been put together by Orton. The entry of the Ruffian opens up a three way dynamic between Joyce, Mike and Wilson. From a seemingly banal kitchen-sink drama in the “Look Back in Anger” mode, suddenly we are in the disturbing world of Orton’s vision of a London where housewives are prostitutes, husbands are murderers and young lads looking to rent a room may be rent boys with a death wish. But the way Orton treats language, character and action means these dark materials dissolve into comedy, farce and humour. None more so than the ending in which Mike reassures Joyce that everything will be ok because after all “the police have wives and goldfish of their own”. To get the joke you’ll have to see the play. The direction by Paul Clayton is excellent. Fast paced, he creates a relentless momentum. There are no wasted scenes or conversations. Everything is necessary and integral to the play. Christopher Madin’s music gets the balance between banality and menace spot on. The acting is as good as it gets. Adam Buchanan is terrific as Wilson and butter wouldn’t melt in his mouth, politely spoken and unnerving, he brings it off superbly. Gary Webster creates an Irish Mike O’Rourke in the mould of Ronnie Kray. Dressed in the uniform of the sixties gangster, suit and tie, braces, shirt rings on either arm and especially the beige crombie, he convinces wonderfully. Lucy Benjamin as the housewife/prostitute Joyce is superb – asked by Mike where she’s been she replies “Woolworth’s”. In that one word is all the loneliness, boredom and yearning of a woman on the edge of a nervous breakdown. When Joyce takes a tranquiliser with a glass of water and throws her head back to aid swallowing, Lucy Benjamin puts so much energy and meaning into the action that I felt it like a thunder bolt. This is a five star production of an absolute gem of a one act play. It is sixty minutes of unmatched drama. 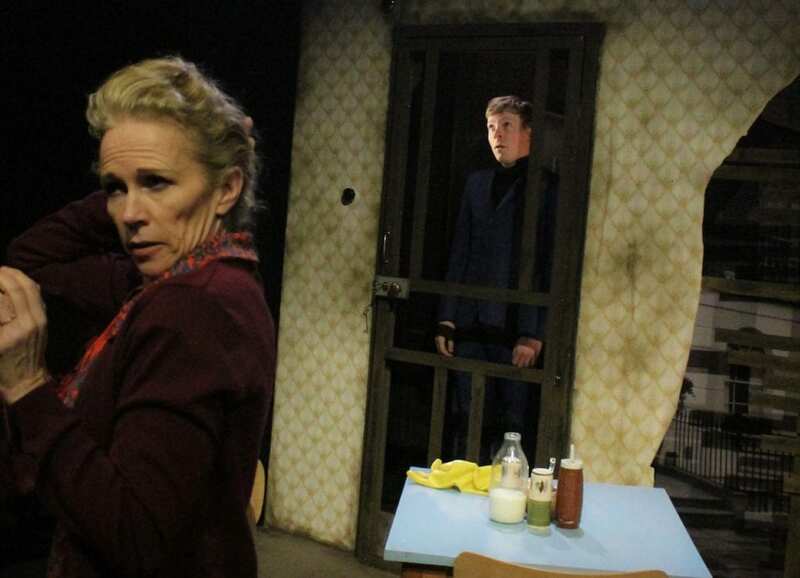 There are only fifty seats upstairs at the Hope Theatre, so the intimacy is truly special. The venue, the history of Orton in Islington and the quality of the production make this Ruffian pure silk. « IS THERE A GOOD AGE FOR PARENTS TO DIVORCE?